One of the most popular games this holiday season is Rock Band. Think Guitar Hero, but multiplied by three. The game not only includes a guitar, but a drum kit and a microphone. Now, all your friends can pretend to be rock stars at the same time! I’ve never played Guitar Hero (and I don’t intend to start), but Rock Band seems like an unclutterer’s nightmare. The storage space needed for all of these fake instrument controllers is ridiculous. For all the strides that gaming has made in making their systems smaller and wireless, they have been demolished by Rock Band. Not many homes are equipped for impromptu jam sessions, so be forewarned as to what you are purchasing for your children. You will have to deal with the consequences of your clutter. And more often than not, you will most likely have to play the roadie and clear the stage of all the fake instruments. That is when I would threaten to sell the game and all of its peripherals. Mom and Dad aren’t roadies and the den isn’t going to be a studio. For more on Rock Band, here is an article in the Charleston City Paper. The Unclutterer staff wants to send off 2007 with a list of our favorite posts from this year. These aren’t necessarily the posts that were the most read or the most commented, but are the ones we love for some reason we can’t really explain. Most of all, we hope you enjoyed them! What should I store in a fireproof box? Do you have a favorite post? We would love to know which posts bookmarked a place in your hearts, too! I appreciate this desk because all of the peripherals and the user’s work product can be folded up with one, quick motion. Yes, the computer will still be visible on top of the desk, but all of the other stuff simply disappears. I like this for someone who works from home because it would make the separation between work life and home life concrete. I’m more than a little envious of this setup. If you’re someone who can’t part with ticket stubs, you may be interested in making something like the Ticket Stub Diary from Uncommon Goods. With this Ticket Stub Diary you can preserve your precious memories from concerts, museums, movies, sporting events, Broadway shows and more. Comes with clear sleeves that fit a variety of ticket sizes, plus space in the margin to write down your memories from the event. Acid-free pages will preserve your memories; so that one day you can tell your grandkids that you met The Boss. Unfortunately, the website says that the exact product won’t be available again until March 2008. Creating your own wouldn’t be too difficult, however, with a scrapbook cover, photo corners, and some acid-free paper (or go for an all-in-one kit). I photograph my ticket stubs and then toss them, so the idea of a memory book for them is personally a bit much. (Concert posters are another issue altogether, which I’ll address next week.) If you’re someone who holds onto stubs, though, you should definitely consider an uncluttered solution similar to these. Thanks to reader Robin for the head’s up about the Ticket Stub Diary! 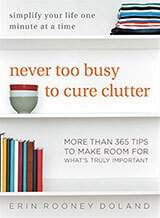 Good Housekeeping has an interesting online tool to help you organize and clean just about every room of your home. It is the 30 Minute Clutter Solution. The solutions are helpful and cover a wide range of areas from kitchens and pantries to laundry rooms. Each tip is supposed to take 30 minutes. This will give you a target as to how much time you should spend on each solution without becoming obsessive about it. We love the idea of combining the Good Housekeeping system with our suggestion of spending half an hour cleaning each day during the week. 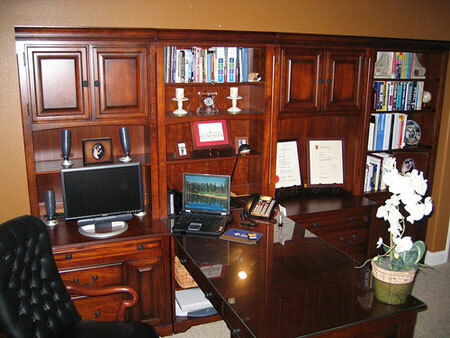 Check out the 30 Minute Clutter Solution. It may become a useful resource for future cleaning projects. My wife and I love garlic. We generally go overboard on our garlic intake, but we tend to have a hefty tolerance for each other’s garlic breath so it works out okay. Even with our mutual cravings for all things garlic, we find this Electric Garlic Roaster ridiculous. Roasting garlic isn’t rocket science. You put it in a conventional oven wrapped in tin foil with a little olive oil. There is no need for another small appliance. 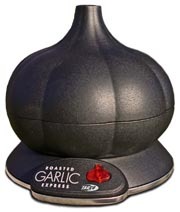 Unless, of course, you are pulled in by this gadget’s cool garlic shape. I guess the shape will help you remember what it is for when you find it in the back of one of your cupboards in 10 years. So, I guess, that’s a good thing. We joke in our home that the refrigerator’s crisper drawer should really be called the molding drawer. It seems to be the place where fruits and vegetables go to rot. 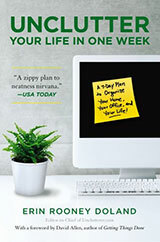 We put things in, forget about them, and then find them weeks later covered in a green goo. Also, when you put fruits and vegetables in the drawer, all of the healthiest items in the refrigerator are instantly out of sight. Only the pizza leftovers and soda pop are right at eye-level. Apples: According to the Purdue Horticulture Dept., apples are best stored in plastic bags with air holes in a 30-32ºF refrigerator. They recommend putting them on shelves instead of the crisper drawer to permit proper circulation and humidity. Do not freeze. Corn: Being from a family of corn growers, I know this one without having to reference anything. In husk, use it the day you buy it. If you’re not going to use it that same day, remove the husk, vacuum seal it, and store it in the freezer. Bell peppers: According to the Texas Produce Association, bell peppers can handle short-term storage for seven days or less at 45-50 degrees with 85-95 percent humidity. If you store a pepper below 42 degrees it will suffer from chill injury. (Which means that I need to use peppers the day I buy them. My refrigerator sits below 42 degrees.) Additionally, don’t store next to apples because of a chemical reaction. Tomatoes: According to the Penn State Agriculture Dept., tomatoes should be stored in an aerated basket on your counter, out of direct sunlight. Putting them in the refrigerator will cause them to lose their aroma and flavor. Herbs and lettuce: According to the Virginia Tech Cooperative Extension, “Lettuce should be rinsed under cold running water, drained, packaged in plastic bags, and refrigerated.” The refrigerator should be at least 40ºF or lower, and you should eat the greens within a week. Do not freeze. Onions: According to the Foodservice Guide, “Store your onions in a cool, dry ventilated place–not in the refrigerator. Lack of air movement reduces storage life. Chopped or sliced onions can be stored in a sealed container in your refrigerator for up to 7 days.” Do not freeze. After looking at all of the research, I couldn’t find a single reason to keep my crisper. So, my refrigerator is now crisper-drawer free. I’ve pulled out the drawers and have deep shelves where they used to be. Rotten food is the epitome of clutter, so hopefully I’m starting out the year on the right foot with my refrigerator’s organization. Additionally, if you want to read more about uncluttering your refrigerator, check out Serious Eats’ post on How to unclutter your winter fridge. Like a good chunk of the western world, Unclutterer’s offices are closed today. We wish everyone who celebrates Christmas a merry one, and the rest of you we wish a joyful day off from work! We’ll return tomorrow to share more Uncluttering insights. 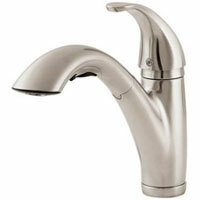 Kitchen faucets have become much more sleek and compact over the years. If your kitchen is still equipped with a traditional two handled faucet and a separate sprayer attachment, you may want to make the switch to something like this Price Pfister model. The water’s temperature is regulated by a standalone arm design that isn’t very new, but the sprayer is contained in the spout for a convenient design that keeps your sink less cluttered. If you do go with a newer and sleeker design for your sink you can install a soap dispenser, as one of our readers suggested. This will further free your sink of clutter by getting rid of those pesky soap bottles that seem to get in the way of just about everything. Wednesday, Bittman wrote a follow-up article that is perfectly themed for the holiday season: “101 Simple Appetizers in 20 Minutes or Less.” Bittman’s low-effort cooking is right in line with this Unclutterer’s style. Enjoy! Are Macs more uncluttered than PCs? There is a discussion board that accompanies our Unclutterer Workspaces flickr pool that I’ve been following since this summer. One of the conversations on the board is titled “Why so many Macs?” and covers the elephant in the room about most of the photographs in the group (ironically, not today’s Workspace of the Week). The conversation that follows is very interesting. Do Macs lend themselves to a more streamlined, aesthetic user? 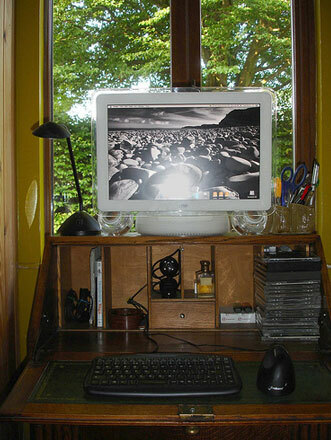 Is there something about a Mac that appeals to a person in search of an uncluttered space? Please check out the discussion and feel welcome to add to it. I find this topic fascinating and would love to hear from more of our readers. I like this office because it has so many wonderful things in its favor. It has a nice, large, uncluttered work surface, a good amount of behind-door storage, and it respectfully displays awards that radix33 values. The orchid also brings life into the room, which is a nice touch. It’s clean, organized, and warm. The desk chair even looks inviting!